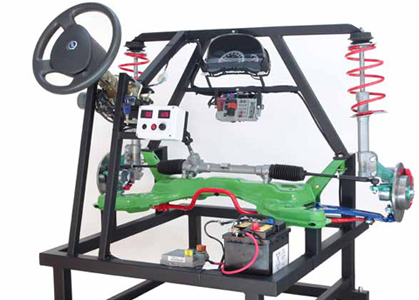 Electrical power steering trainer in working conditions with fully operating McPherson suspension, for the study of the steering system. Any information used by the steering (car speed, alternator, city, steering effort) can be varied by the user. An instrument cluster and two displays show all information concerning the operation.